My first week as a nomad in Mexico. I have been preparing for this for some time. In the fall, I left a cush job with good pay and benefits, and moved into a space of the unknown- not knowing what I wanted to do next with my life. My daughter is grown — she has flown the nest. I was working and volunteering my time in professional pursuits that had potential, and yet this space opened where everything I had previously created began to fall apart and come to a close. In the ancient traditions, so often endings must happen before the new can emerge, and so I wanted to trust the process of endings, and to wait for the new beginnings that I felt would next emerge. During this time, I sold my house and another investment property, and questioned- what’s next? Over these last six months, as doors closed, I began to open to the possibility of a new way to live. I sold my car and lived car-less in Austin– not an easy feat for someone after over 20 years of living with the freedom and autonomy of navigating on my own schedule and vehicle, and also in a city that is really designed more for cars, less for mass transportation. I became more flexible with my needs for transport and learned numerous methods of getting around town. I downsized, moved to an apartment and re-learned how to live in a simpler way. I walked or rode the bus to where I needed to go, asked for help from friends more often, and I softened from having the status that I didn’t even realize I had achieved, by immersing myself with a rainbow assortment of socio-economic ranges and individuals. I became more humble and grateful. So…here I am, six months later, and I have chosen to give away most of my possessions and just take what I can carry with me on my “world tour”. I have a rough idea of where I will go. The map I am following is from the compass within my heart- the needle and direction are leading me to my own True North. So, what have I learned so far? On my first night in Puerta Vallarta (also known to locals as PV), on the west coast of Mexico. I stayed with friends of a friend, a couple I hadn’t met before, but who were kind enough to open their home to me and show me this town that they have retired to. In this experience, I learned more about opening to kindness, even from strangers. A blessing to be sure. The next day, the friend I was to rent the lower half of a house from in a small town an hour north of Puerta Vallarta (PV) picked me up, along with two other awesome wild women in tow. 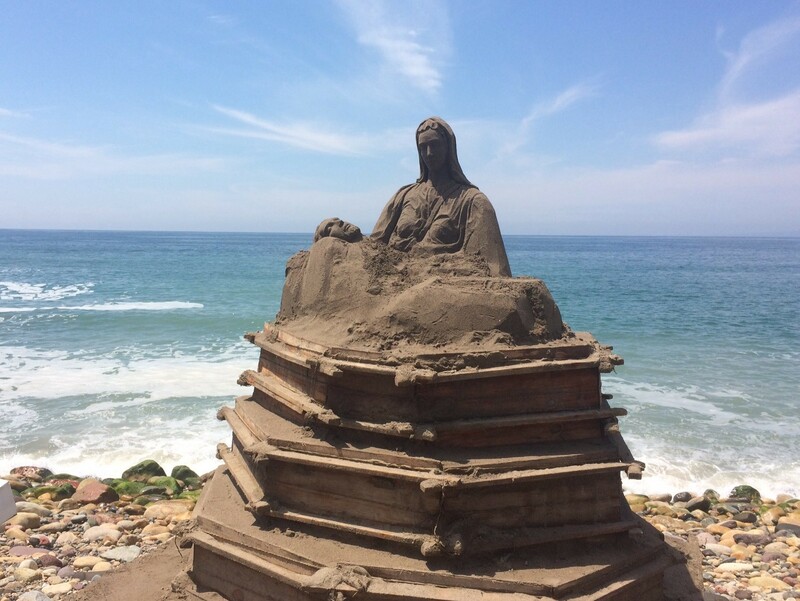 We began a road trip, first walking the boardwalk in PV, exploring the artwork and lush ocean front artisans along the way. We continued up the coast on our trip, stopping at quaint little villages along the way. I drank something called “Agua de Cacao”, essentially some chilled blend of coconut water with raw chocolate- a drink that I believe could accurately be known as nectar of the gods- absolutely divine. Each place we stopped in to in this small town, San Pancho — from the chocolate shop and the quiet cobbled streets to an upstairs villa we visited with open air living spaces and gentle breezes surrounded by gardens — felt like a breath of fresh air. No rush, just living in a gentle tempo and a gracious pleasant ambiance. The next town we visited, Sayulita, was somewhat larger and definitely had a more hustle bustle vibe, as this town draws surfers from all over the world to its beaches. Here we met a woman artist in her mid-70’s, an American living in Mexico for part of the year, who at the age of 69 decided to take a break from her life, a hiatus of sorts, and literally take a hike- a 150 mile hike over 6 weeks across Europe on the Camino de Santiago. Inspiring at any age, but at 69 years old, a powerful testament to how aging doesn’t need to be a rough decline into obsolescence, but rather a vigorous exploration of life, health and vitality. Following our road trip, we landed in Chacala, a quiet beach town, and over the last few days I have been acclimating to the slower pace. I am practicing going with the flow, including taking some down time every afternoon for “siesta”. And my learning continues. I continue to build an appreciation for my ability to surrender to the process of life. I take each day a moment at a time, paying attention to what is my truth, what is important to me and what is not. In sharing stories with “elders”, those who have a few decades on me, I can listen to their stories and understand that there are many ways to embrace the second half (or third or next chapter) of life. I appreciate my ability to cultivate new friendships and to gather important tips for how to effectively navigate nomadic living in style. And I continue to sit with the question- what is next for me, what is important, what is this next chapter of my life to be about? What would l like to create it to be? Stay tuned…I will share what I discover, plus more about my adventures, in upcoming posts!